1. A standardised set of HTA questions (the ontology) allow users to define their specific research questions within a hierarchical structure. 2. Methodological guidance to assist in answering the research questions. 3. A common reporting structure for presenting findings in a standardised “question-answer pair” format. The Guiding Principles on the HTA Core Model Use provide the basic functionality of the Model’s application in various settings. The HTA Core Model is accessible free of charge but subject to the HTA Core Model Licence. HTA Core Model for the production of core HTAs (version 3.0). 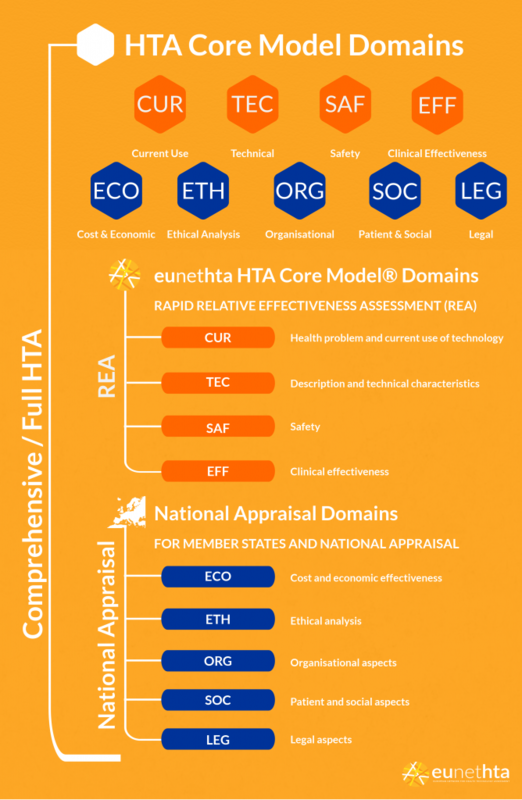 HTA Core Model for the production of Rapid Relative Effectiveness Assessments (version 4.2). Guiding Principles on the HTA Core Model use. Various formats of the Core Model can be accessed through the HTA Core Model Online Website.